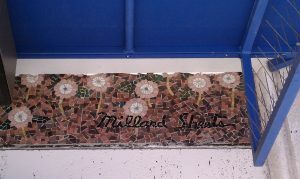 Visiting Highland Park recently, to see the mosaics installed in the early 1970s, the shifting tides were obvious: the feel on the street, the look of the businesses all around the location reminded me of the working-class Latino businesses of El Paso more than the environs surrounding most of the southern California Home Savings locations. Given the timing of its construction, I assume the contrast is more about changes in the local landscape than an effort by Home Savings to court Latino customers under President Nixon. The neighborhood is alive with visual culture, however; this is just one of the vibrant painted murals on the alley side of buildings along this main drive in Highland Park. 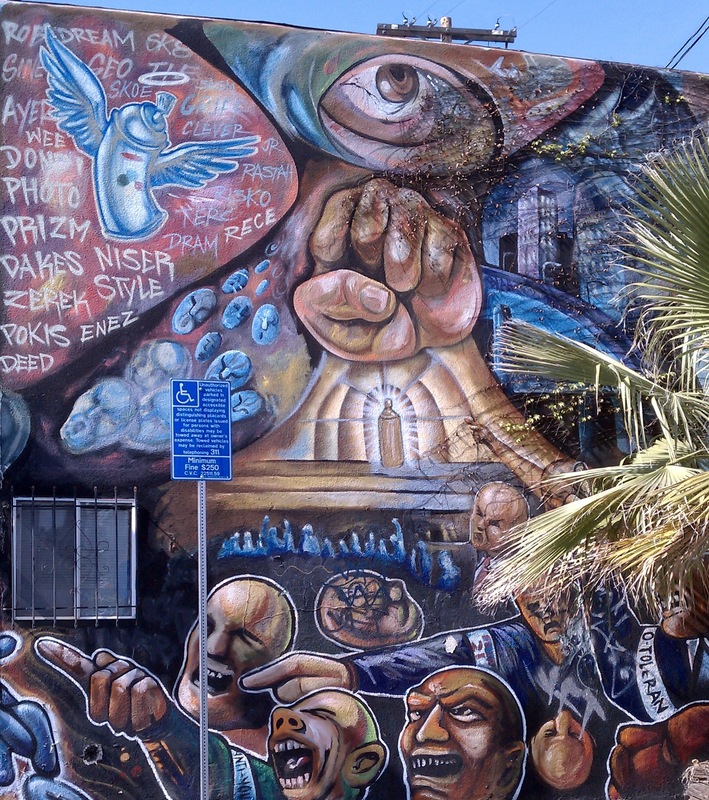 This fall, I am leading a bus tour of Home Savings locations in the San Fernando Valley for the Autry Museum, linked to their Pacific Standard Time exhibit on pre-Chicano Mexican American muralists. Highland Park’s murals are of more recent vintage, but the parking lot behind the bank is one place to take in the contrast. When I asked the bank teller about the mosaics on his bank, he pled ignorance; “I’m not from here,” he said, in a way that seemed symptomatic of the difference between Home Savings’ deeply community-based approach and Chase’s more national profile. And yet another case of Chase’s mishandling of the artwork: this awning does help shade those standing at the ATMs, but did the angles require them to cut into the mosaic–and separate out the Sheets signature–to do so? I can’t say the anti-pigeon-roosting spikes make it seem very hospitable, either. See you back here April 8th–next week I am in St. Louis, to present at the Business History Conference about Home Savings, and elsewhere about my current book. We discussed the intersections of our research while browsing the Denis O’Connor Collection at the Huntington Library — and Lillian alerted me to a letter she saw, at once heartbreaking and mysterious. 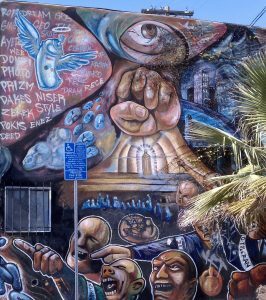 …please note that you can have the murals if you are willing to pick them up and pay us for the costs incurred for their removal….If we do not hear back from you within thirty (30) days, we will assume that you do not want the murals. As Lillian said, what a heartbreaking thing to receive. Did Denis follow up? What was the cost — a few hundred, a few thousand, or tens of thousands of dollars? 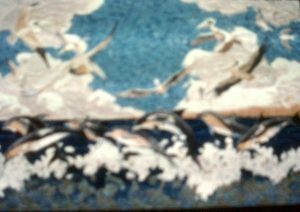 The mosaic, from 1988, and showing pelicans and dolphins, was not massive, but the effort to remove it from a demolition site intact would have entailed most of a day. 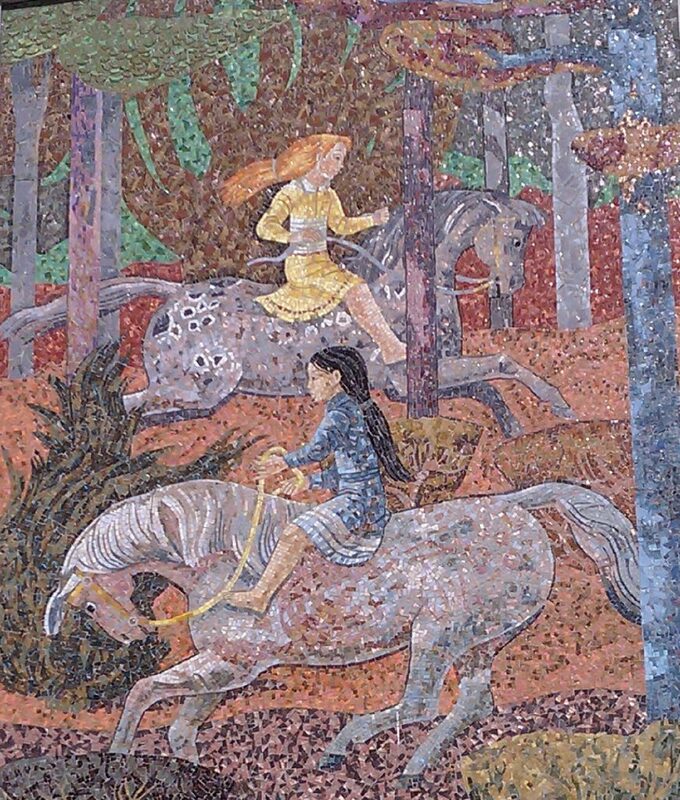 In any case, there is no record of Denis’s response — and no record of what happened to the mosaics. The company that oversaw the demolition, The Tides Building LLC, seems to have been a part of The Braemar Group; all the phone numbers listed in the letter, or on the Internet, are disconnected. But even if the company went bankrupt, was sold, or otherwise disappeared, the assets involved likely did not–neither the $18.7 million for the building they constructed in the bank’s place, nor mosaics. Sam Watters, in his March 2010 Los Angeles Times “Lost LA” column reflecting on the themes of the Home Savings artwork discussed every week on this blog, mentioned the site as “reduced to rubble,” but we can assume that was hyperbole rather than a confirmed kill, until we hear otherwise. Have you seen them? Are they in your backyard? Did you write this letter, or were you involved in the Home Savings’s building’s demolition? Historians, and some interested museums and collectors, would love to know! So that’s the Santa Monica mystery for today. As for the Glendale mystery above: the records I have searched suggest no artwork was designed for that site, so perhaps the construction crews simply cut a hole for artwork that was never to be there. for the Home Savings shield that was once there. 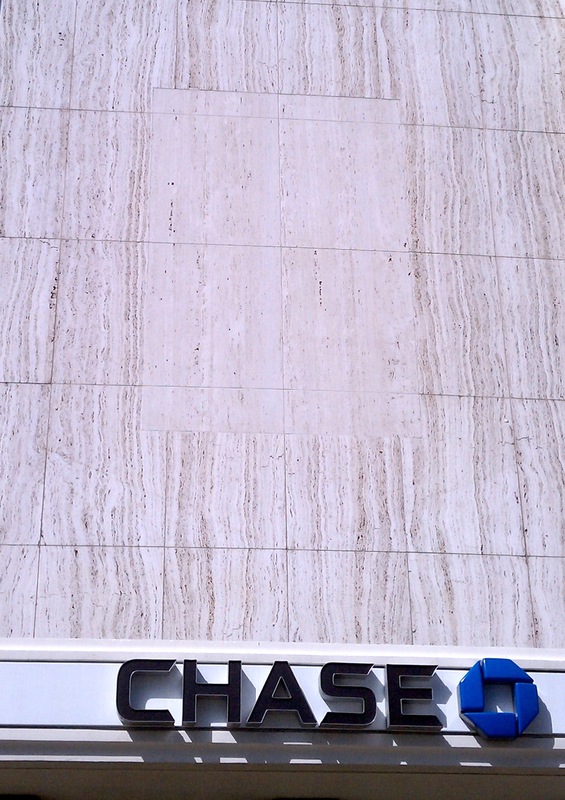 But the records are also incomplete–do you remember artwork in that spot, facing the parking lot off Brand in Glendale? If so, let me know! February turned out to be a busy time–so much to do, so few days to do it?–and the start of March offers no let-up. Most of the time I am happy with so busy–research, writing, conferences, commuting, teaching, grading, and that is just for work–and it beats having nothing to do, though that seems an impossibility nowadays. But it has meant that I have not been out on the streets, tracking down Home Savings and Sheets Studio archives and statuses that much recently. At least spring break is coming soon. 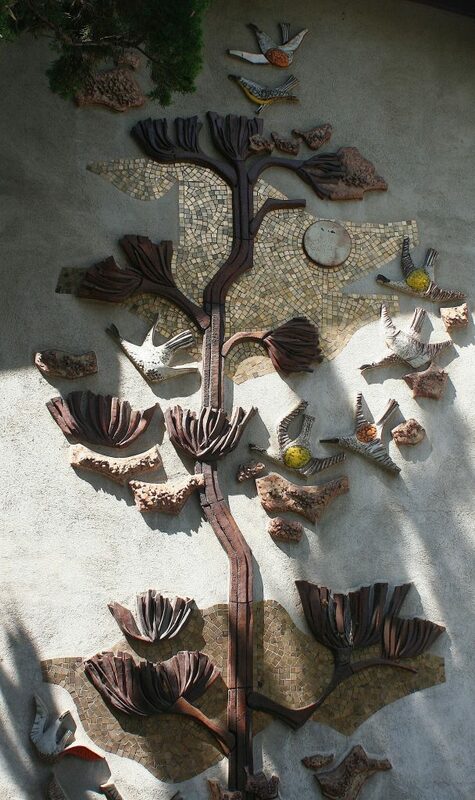 So, looking through my own Home Savings photo archives, I was struck today by the calm of this simple mixed-media tree with birds, completed by the Sheets Studio and affixed to the end of an office building in Claremont. (I think it it is on 4th, between Harvard and Yale avenues.) It seems a perfect image for spring. Trees and birds seem to have been almost as important totems for Millard Sheets as horses; from his home in Gualala to numerous compositions in many media, the tree filled with the sights and presumably sounds of birds reflected a sense of contentment and joy that the Sheets Studio work exudes. I assume this is an early piece, as the mosaic tiles are used merely as background, and the birds and tree is represented in three dimensional ceramics, some with colorful accents. 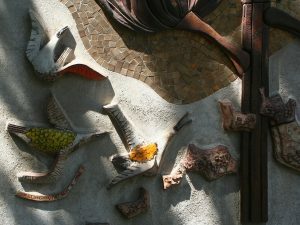 What comes to mind are other earlier works — the sculptural birds and trees, as well as other animals, by Betty Davenport Ford, and the marvelous bull at the LA County Fair’s Millard Sheets Center for the Arts building, completed in 1952 by Albert Stewart and John Edward Svenson. Like the tapestries, they represent the efforts to use color and modernist lines to rethink traditional art forms, as Picasso, Miró, and others were doing in these same years. This is at least as labor-intensive as the glass-tile mosaics, harder to install, and likely far more brittle, so harder to maintain. Nevertheless, this example has held up wonderfully–and likely adds a quick, upbeat note to all those who notice it, as they walk in the leafy, sunlit streets of Claremont.